Well as you may know, there are quite a few new releases this week, but I narrowed it down to two, it was between Inna and Little Mix's "DNA", the only reason I chose Inna was because it is currently doing not that well on the iTunes top 1000, and I hope to help a little bit with this review, whereas Little Mix is climbing up that chart quickly. Inna, real name Elena Apostoleanu, is one of these artists who have had quite a few chart hits, and then a few that didn't make the chart, but was worthy of it. She has yet to promote any songs or albums in the UK, relying on fans and music channels, hence why this one might not get on to the UK chart, although it definitely deserves it. The collaboration comes from Flo Rida, real name Tramar Dillard. He has become extremely popular, and you would think that this collaboration would help this song climb higher and higher, but there's just zilch, nothing. 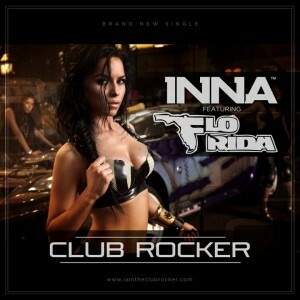 "Club Rocker" was written by Sebastian Barac, Radu Bolfea and Marcel Botezan. Once again, the same names are popping up, and clearly they are writing amazing songs, it's just the lack of promotion that is unfortunately making this song fail, amongst the others. I hope it will climb up the chart as it's extremely catchy and Inna deserves it. This music video... What do I even say about it... Once again we see the flirtatious Inna found in her previous music videos, however what makes this video different is the similarities to other artist's music video. There is many music videos that link, but let's just name a few, there's Taio Cruz's "Dynamite", Rihanna's "Shut Up And Drive", Basshunter's "Angel In The Night", Kylie Minogue's "All The Lovers" and Lady GaGa's "Born This Way", there are others so if you can come up with some comment below and I'll be more than happy to add them. However this isn't just a basic mash-up of music videos, there is a storyline and that is what makes this a lot more complete as to other mash-up videos. I like the start using Twitter to ask to compete in a race. I like the race overall and of course Inna has to win. I definitely like the lift, but what do you expect? Flo Rida doesn't make an appearance, however his vocals can be heard at the start and I think they should've had a scene with him in. Overall, a very catchy song that was made for the UK, but unfortunately not enough people know about the song, and therefore it won't catch on. As for the accompanying music video, it's fun to watch, it's a mash-up of other videos we have seen, but they have made it complete and interesting.